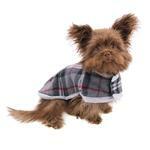 Keep your pets cozy and warm this winter with the Zack and Zoey Nor’easter Dog Blanket Coat in Gray! 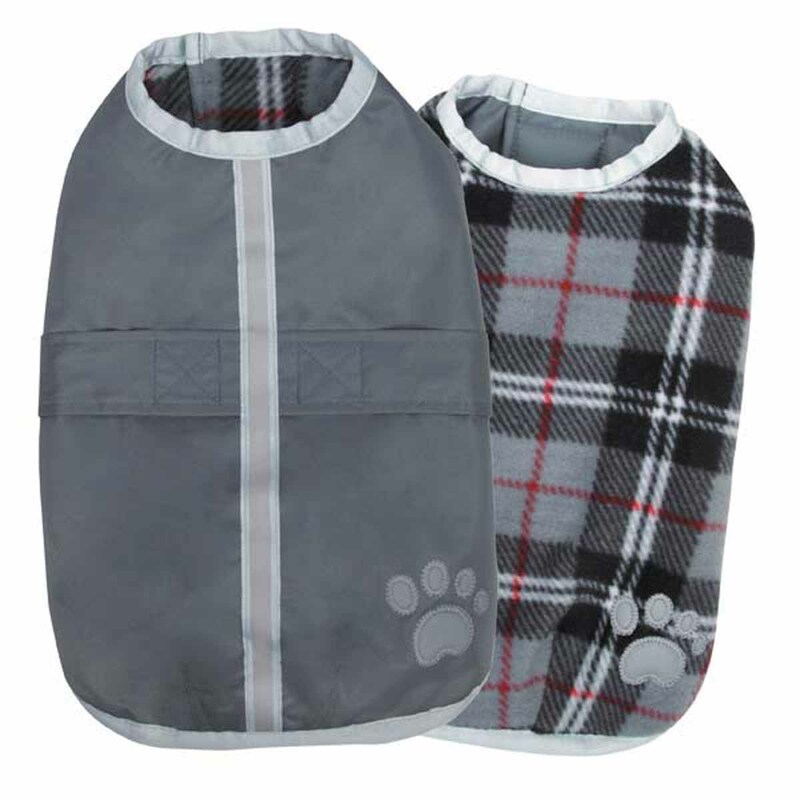 Help pets take a bite out of nasty weather with Zack and Zoey® Nor’easter Blanket Dog Coat in Gray. This jacket features a reversible waterproof shell, a soft plaid fleece lining and a reflective stripe and paw print detailing. We love this neutral Gray color and classic plaid. This coat is a great color that won't show the dirt, which is always a consideration with some pets! Should your dog's coat require laundering, machine wash it in cold water on a gentle cycle. Line dry. On this particular coat, the back length is most important. However, if your dog has a stout build or a broad chest, take that into consideration and select one size larger. To obtain your pet's back measurement, measure length of pet's back from the base of the neck to the base of the tail. Zack and Zoey Nor’easter Dog Blanket Coat - Gray Customer Photos - Send us your photo! Posted On 01/23/19 by Johnice R from Cambridge, MA Yes, Johnice R recommends this product! Posted On 12/19/18 by suzanne z from Montesano, WA Yes, suzanne z recommends this product! This is our third Zack & Zoey Blanket Coat. So easy to put on & take off. No loops around legs or over the head hole, just Velcro them around the tummy & front neck. Our Havanese are about 8 & 10 pounds. I ordered Size Small. The length is perfect, Velcro around the tummy is a bit long but can work with it. I highly recommend these coats. 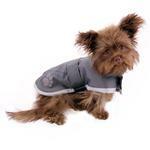 Our first Z & Z coat was purchased at a pet store. They said these coats are their best sellers. I can see why. Posted On 11/30/18 by bette s from , Yes, bette s recommends this product! This is a great coat. My only issue is that there could be more velcro at the belly. ONe little strip is a bit stingy....Dog hair and fuzz always gets stuck in the velcro and then the jacket doesn't stay on...this happened with our last coat from this brand and the velcro gave way when I tried to clean it. So for a great cost, they could have done better. sort of built in obsolescence. Posted On 10/24/18 by Bonita J from Troy, MI Yes, Bonita J recommends this product! This is the second one I bought. Love it. Easy in and off. And looks really cute. Posted On 11/08/17 by Mamie Z from Fresno, CA Yes, Mamie Z recommends this product! Great for EARLY morning or rainy days! I love this style for the ease of how it goes on for early morning potty trips outside. Flannel lining gives warmth, I have 3 Boston Terriers (Barrel chest) I put their Rain coats on for a quick potty stop and then its back inside the house. However, I had to add Velcro extensions on the neck & underside, wish the Velcro patch was larger/ longer. Posted On 09/28/17 by Patricia S from Gardnerville, NV Yes, Patricia S recommends this product! My two pups love these coats and so do I. 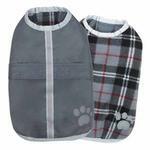 They are so easy to put on the pups, and they move freely while keeping warm. Posted On 03/06/17 by Kim D from Mokelumne Hill, CA Yes, Kim D recommends this product! First two jackets i ordered were to small and the third one is way to big. Posted On 01/24/17 by lisa r from Bloomington, MN Yes, lisa r recommends this product! My Pit Bull is always cold on our winter walks, but he's hated coats. This one is lightweight enough that he'll wear it and warm enough he'll stay outside. Plus it just makes him look so dapper :) Love it! Posted On 01/07/17 by Brenda V from Butler, PA Yes, Brenda V recommends this product! This is a very nice coat. I ordered a size to big...my fault, but I just moved the Velcro and it works fine. It was 4 degrees this morning and I was glad my boy had this! Very warm and looks beautiful. Posted On 01/06/17 by Bill E from Palatine, IL Yes, Bill E recommends this product! Added to the Nor'easter coats my pups already have. Great for the cold weather and allows me to add extra layers underneath when it gets really cold. So easy to put on and take off. Looks good in all the colors we have and the white reflection tape is good for when we walk at night. Works well as a raincoat as well. Posted On 12/18/16 by Susan R from , PA Yes, Susan R recommends this product! The fit is great. Makes me feel better that my girl will be warmer while going out. Extra bonus that it is reflective. Posted On 12/17/16 by james z from mishawaka, IN Yes, james z recommends this product! Posted On 12/16/16 by Kim Gardner from Columbus, IN Yes, Kim Gardner recommends this product! Sizing is perfect per the details. Very good quality. My dog loves this coat! Can be worn either side out so also serves as a raincoat. Extremely well made of good quality materials. Posted On 12/05/16 by cindy D from , Yes, cindy D recommends this product! We have a bullmastiff 8 months old so I got on Baxter Boo and looked for the biggest coat they sold .Love that its reversible wish I could have gotten a different color but we were going for size it is hard to find things for bigger dogs.Its a little big but at the rate he is growing we hope we will make it through the winter. Posted On 10/26/16 by Sarah W from Playa del Rey, CA Yes, Sarah W recommends this product! These are great for keeping my little ones warm during chilly walks. Easy to get on and off and the inside is a cosy fleece material. Love them! Posted On 10/13/16 by Barbara G from Grand Junction, CO Yes, Barbara G recommends this product! I like the jacket , but I need to return it for a smaller size. Posted On 02/20/16 by Teresa K from Lake St Louis, MO Yes, Teresa K recommends this product! We moved from Texas to Missouri and our Jack Russell Terrier - JayTee had his first real experience with much colder weather. Since he does not have a natural heavy coat of fur I thought it was time to buy him one. This coat is perfect as the nice fleece like liner keeps him warm and the repellant side of the coat keeps off the snow and rain. Love the colors on him too. I'm happy I chose this coat.